Guess what . . . I was commissioned to make a dress for another young lady in my daughter’s preschool class! I donated several Charlie Tunics I made a while back to the preschool fundraising auction, and the mom of my new “client” bought one for her son. Unfortunately, I didn’t have one in her daughter’s size, and it really is just this little girl’s style. So I suggested that I make one especially for her. 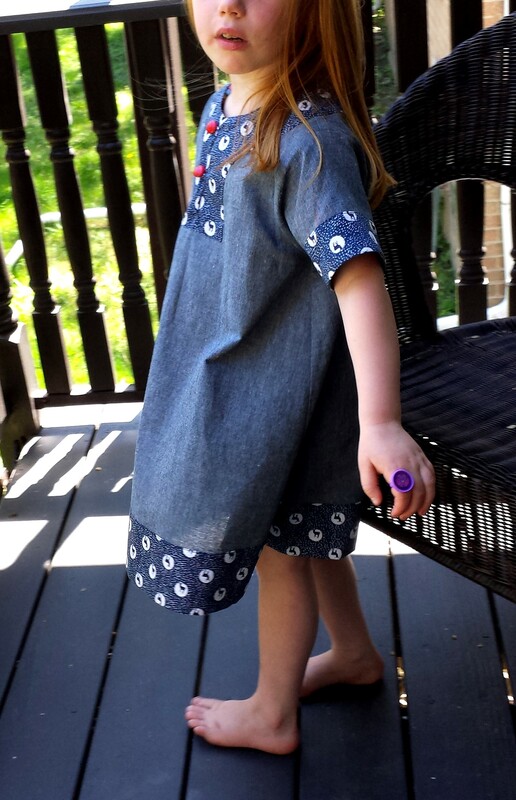 After a few emails about fabric choice and design, we settled on a dress version with short sleeves for the summer. This family is fond of Japanese design, so I sent the mom lots of Japanese prints to choose from for the facings. Fabricworm has no shortage of Japanese prints, so I’m afraid she was a bit overwhelmed at the selection. 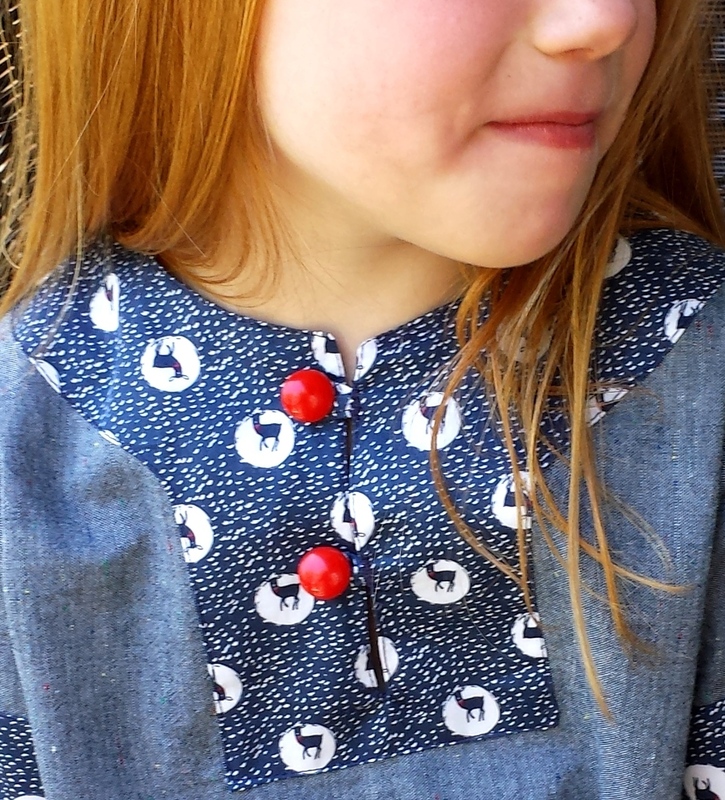 After some consideration, she chose Deer From my Heart in navy from Kokka. 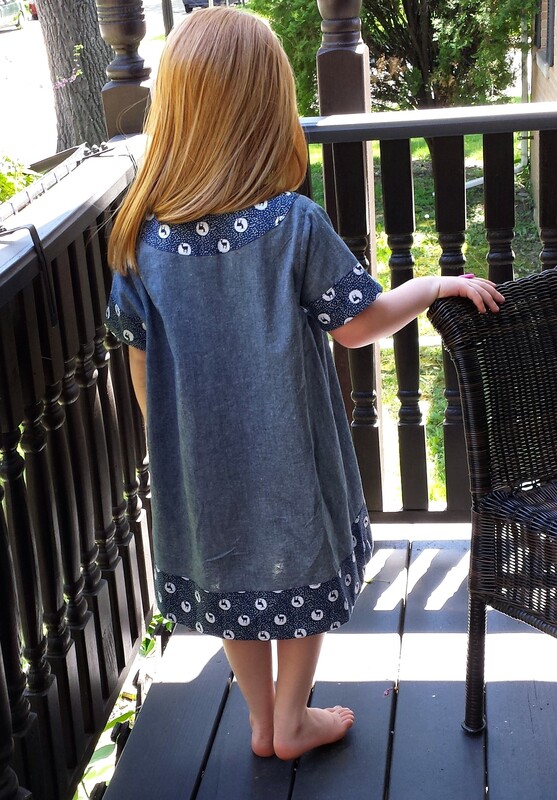 The recipient of this dress loves to wear blue, so this Robert Kaufman Chambray Union in indigo was an easy choice for the main fabric. When I ordered the chambray, I didn’t realize that there are little tiny flecks of bright red, yellow and blue running through. It’s very subtle, but makes a great up close detail. If you look very closely, you can see that there are also tiny bright red dots on the necks of all those little deer on the facing, kind of like bow ties. So, there also had to be bright red buttons, don’t you think? 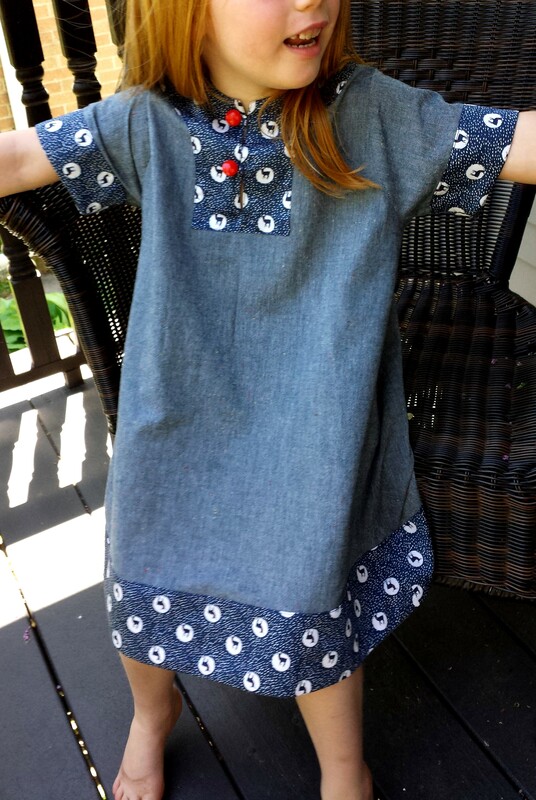 The original Charlie pattern from Made by Rae comes in tunic form. 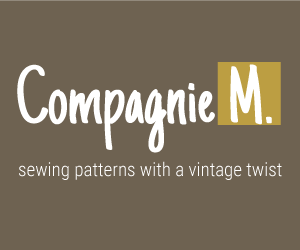 But if you’d like to make it into a dress, you can buy a Charlie Dress PDF Add-On that gives you an additional pattern piece to tape onto the original tunic pattern piece, adding length and also making it wider at the bottom, giving the dress an A-line shape. The add-on also includes the pattern piece for the bottom facing, as well as instructions for a 3/4 length sleeve if you decide to go in that direction. The facings for the cuffs are a little different in the dress version, too. I have made quite a few Charlie Tunics and a couple of Charlie Dresses in the past. I love this style — it’s really unique and so very chic. I also like that it works for both girls and boys. Alas, neither of my girls are into it right now. Don’t ask me why. When I ask Kiki if she would like one, she says “Naaaaaa.” As for Lulu, if it doesn’t have a skirt that “spreads around,” forget it. Ah well. Needless to say, I was so glad to have the chance to make one for someone else who is sure to wear and enjoy it. 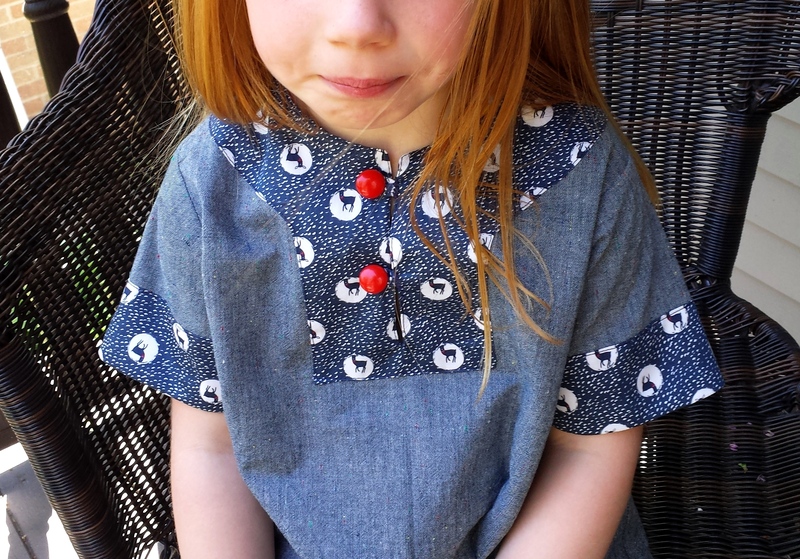 This little girl has worn her new Charlie Dress to school several times and looks as cute as can be in it.